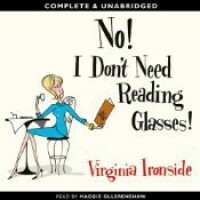 A few years ago, I read "No, I Don't Want To Join A Bookclub" by Virginia Ironside. It was a diary of her character's sixtieth year and it was that rare thing, a book that was witty, humane and spoke truthfully about getting older. "No, I Don't Need Reading Glasses" is the diary of the sixty-fifth year of the same character. My wife and I are both sixty-one and as we listened to this audiobook we kept finding ourselves laughing and saying - "yes, that's EXACTLY how it is. Why does no one talk about this?" If you in your sixties, or you want to know what it's like to be in your sixties, this is the book you should listen to .